Don’t ever be afraid of change. Always remember, God will never take anything away from you without the intention of replacing it with something much better. God takes care of the lillies in the grass, He is sure to take care of us. The Bible reminds us that lillies do not work or save money to eat, yet the earth which is God’s footstool, provides them water and nutrients. God provides some of us jobs, to others He provides scholarships, grants, government funding, loans and business ideas. If God took your business away, your apartment, your job, your significant other: He is simply setting you up for a powerful comeback. If we know God at all, we know He likes to glorify Himself and make Himself known through our lives. We ought to recognize that even when it seems like the work of Satan, it is usually in motion because God has allowed it. In the story of Abraham, if we remember correctly it was God who told Abraham to sacrifice his own son. It was the same God that provided a lamb, so that Abraham could still offer him the offering. On the way to the place of sacrifice, Isaac asked his father: where is the sacrifice? 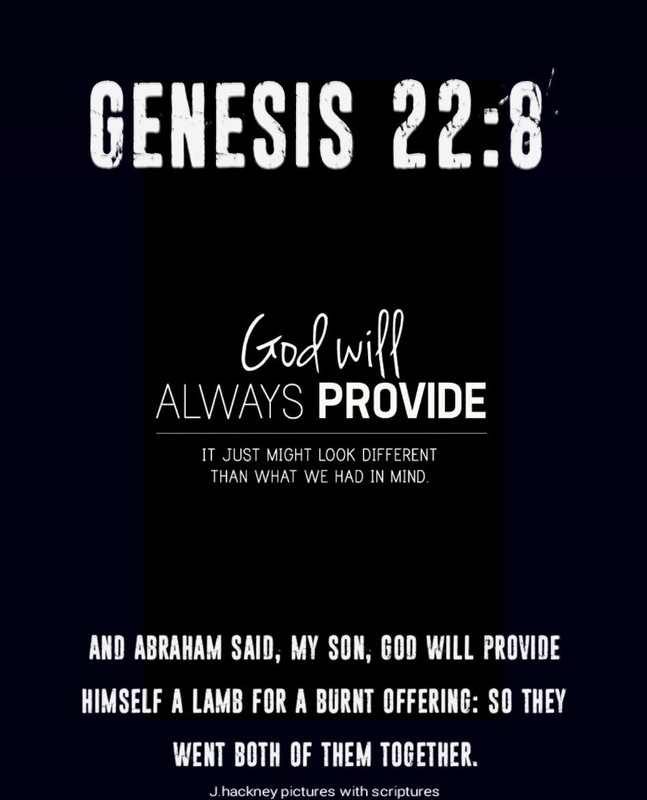 and Abraham told Isaac: God will provide Himself a sacrifice. God allowed the slight turmoil in Abraham’s heart, and confusion in Isaac, so that He could show them that He is Jehovah- Jireh. The Bible also says that God told Elijah that he would close the heavens and there would be no rain upon the land until he opened them again. First Kings 17, says that God instructed Elijah to go to a certain place by a brook and that ravens would bring him food. Elijah was obedient and went, here the ravens would bring him bread and flesh (meat, fish, birds). God became a provider for Elijah, Jehovah the provider. After the brook dried up, God had another place where He could stay for about a year. Elijah went to the widow woman’s house. She only had a small amount of oil and a small amount of flour to feed herself and her son for the last time. God had spoken to Elijah and had told him He had made provision for him to stay there for some time, and when he met her God made her a promise if she followed Elijah’s instructions: she had to make food for Elijah first and then she would see that her food would not finish. And it didn’t! Elijah’s faith led him to help a widow woman, as he was also being provided for. The widow woman’s faith caused her blessings to come: she had God’s provision to preserve her son’s (and her own) life. What did it take for these people to receive provision from God? Jehovah Jireh, my lord and supplier we praise you for your tender mercies and care over our lives. We thank you for providing the sun and the moon, the air, water, our loved ones and homes. I pray for those who have lost a dear thing, or are in the middle of change and are not sure what is going on. May your grace keep them afloat, may their hearts grow with fervent prayer and may their spirits have greater conviction of who your are and what the Bible’s says about you. I pray for increased wisdom, discernment and sensitivity to your Holy Spirit. In Jesus name, Amen.